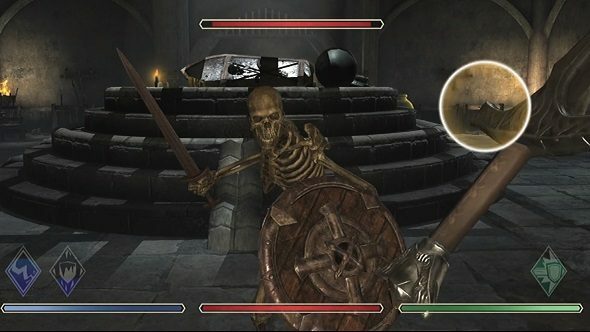 Bethesda has announced a new Elder Scrolls game! Ah, wait a moment, don’t get too excited, we’ll get to the really big news later. The new game is called The Elder Scrolls: Blades, its first release will be exclusive to mobile, with free Android and iOS releases scheduled for this autumn. The Elder Scrolls: Blades lets you explore procedurally generated dungeons and carve away at enemies with your fingers. There are three modes; a roguelike called Abyss, a PvP mode called Arena where you battle enemies one on one, and a story mode, called Town. In that, you feature as a member of the Blades, the top agents of the Emperor, based out of Cyrodiil. Ok, Blades isn’t technically a role-playing game, but it’s based on some pretty major genre heritage, so check out our list of the best RPGs. Blades has been designed for touch screens, and works but using on-screen dual sticks to cast both melee and ranged/magic attacks, which follow your swipes. It’s basically Elder Scrolls: Fruit Ninja, or Infinity Blade, if you preferred your late ’00s mobile gaming a bit grittier. Todd Howard says that Bethesda wants to bring The Elder Scrolls: Blades to as many different platforms as possible, and yes, that includes PC. You can also expect to see blades in VR, and on console. Now for that other big Elder Scrolls news we promised – The Elder Scrolls VI was revealed at last night’s conference. Blades will have to tide you over until that game actually comes out though, as I don’t expect we’ll get our hands on it until 2020.